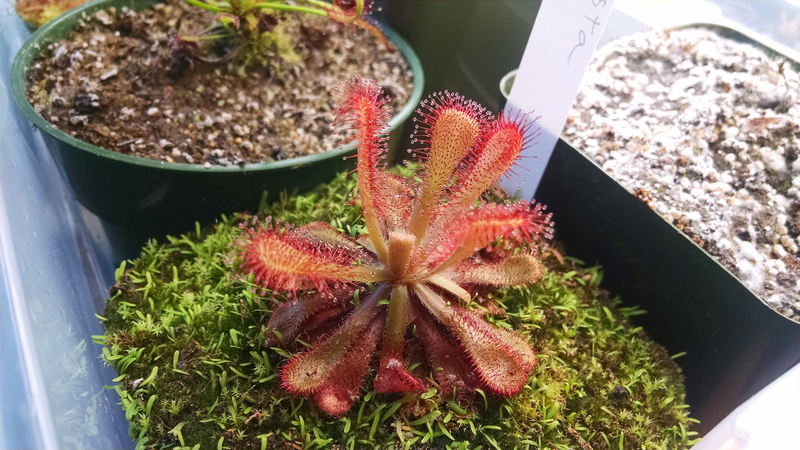 Cultivation Guides: Benign Neglect |Sundews Etc. Sometimes it's important to ignore your plants. While some plants may need (or seem to need) constant attention lavished on them, a lot of the time more attention means more stress. This is a difficult balance to strike – sometimes a plant is in decline and will die without fixing whatever the problem is. But lots of growers are familiar with the opposite phenomenon, that of a plant given the barest attention, left for dead, that comes back healthier than ever once it's left alone. 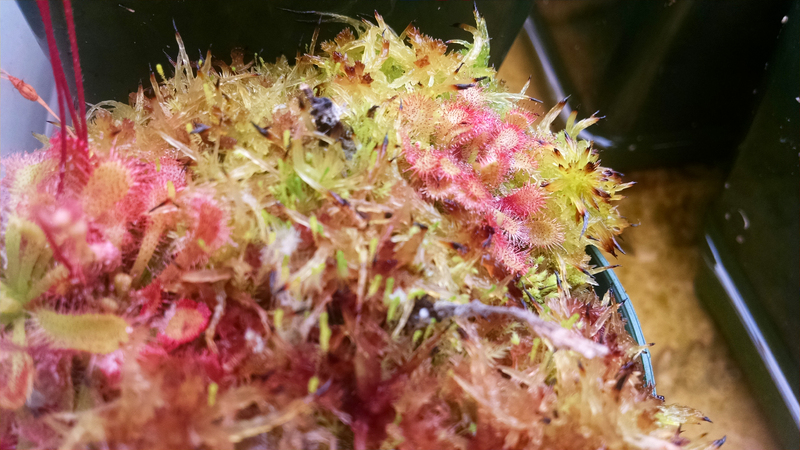 Check out this mystery sundew that I assume is a Drosera spatulata but which wasn't labeled and so who knows really. Drosera spatulata? Probably! But really, who knows. 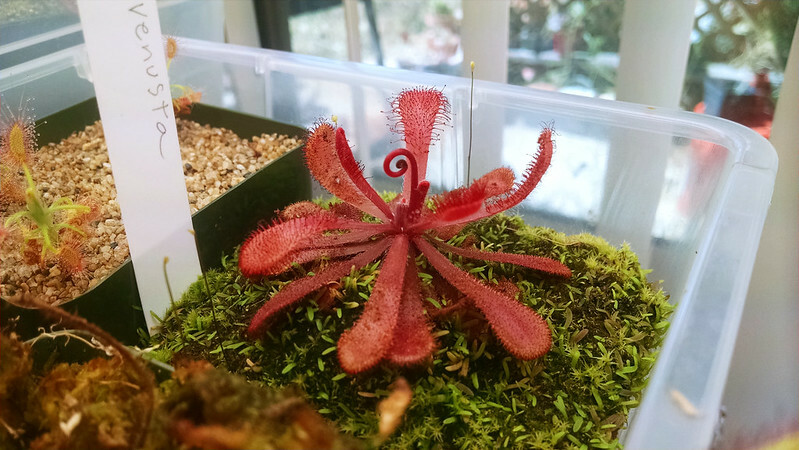 Let's just call it "Drosera spatuhaha" and be done with it. This is a little 2-inch pot that I got from a nursery back in January. 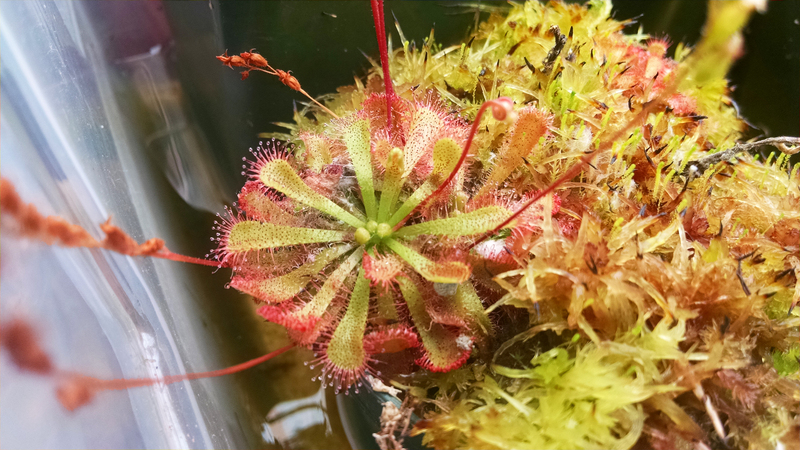 I actually got it 2-for-1, since apparently the place didn't get much call for sundews. Things were a lot more primitive back then. In January. They had the dreaded plastic domes on them, hadn't seen the sun in weeks, probably, and were generally doomed. No dew, no color, thin growth – I would have been happy if they lived. Which they didn't. Maybe a month after acquiring these helpless little plants they had shriveled up and I took the pots out of the tray to make room for something else. Luckily, I'm lazy and not very tidy, since instead of getting tossed, the pots just sat near the tray for a couple weeks, until I noticed something growing. At the time I was a bit distressed, having given this pot over for dead, but I stuck it back in the tray, figuring that I didn't have to pay it any mind, since the thing had already died. If it wanted to live it would live on its own. It was around this time that I noticed this pot doing really well. The large plant at the back was the original, and the little one to the right sprouted sometime later. 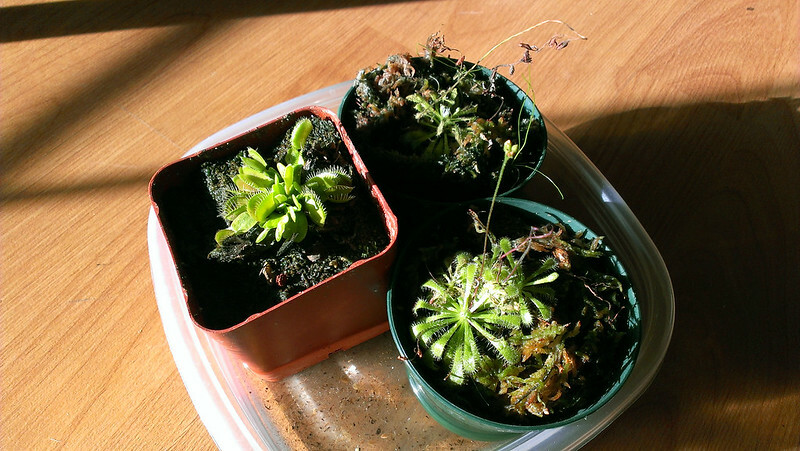 The degree of neglect experienced by these plants is is indicated by the fact that the above picture was taken in early June, about 4 months after it died and was reborn. I just didn't really look at it much in that time. Focusing on other things really let this guy take off. I've never harvested seed from those flower stalks for some reason. A month later and not much had changed (though I'd cut that grassy weed back). 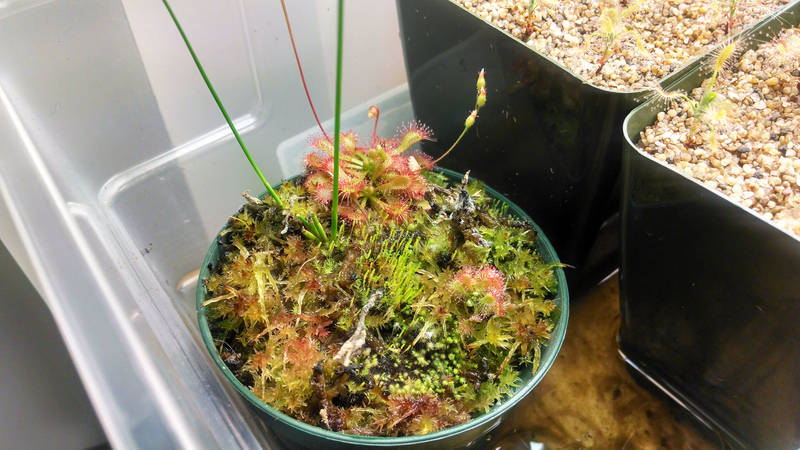 The Sphagnum in the pot was coming to life, the color and dewiness of the D. spatulata was very pleasing, and the big one was blooming away. Shortly after this I finally extracted that weed from the pot, roots and all, and the pot is looking better than ever. What does this experience tell us about maintaining a collection? For one, not to give up too soon on a plant that appears dead. Whether it came back from the roots, or sprouted a seed, the original doomed plant just needed some time to decide to live again. If I had been to anxious to clear everything away I would not have this nice pot. 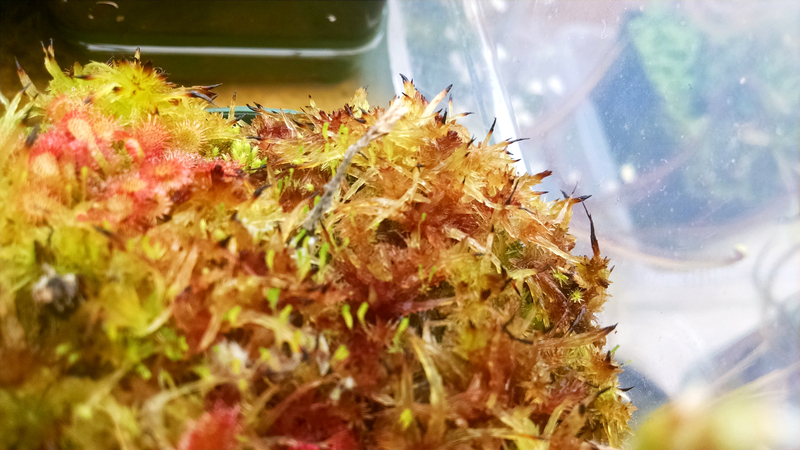 The Sphagnum growing in here is the prettiest in my collection! This Sphagnum is just so lovely. It really perks up the pot! I think it's also worthwhile to consider the virtue of patience. I've only been collecting plants for about a year now, and initially it was a little difficult adjusting to the time scale of plant growing. 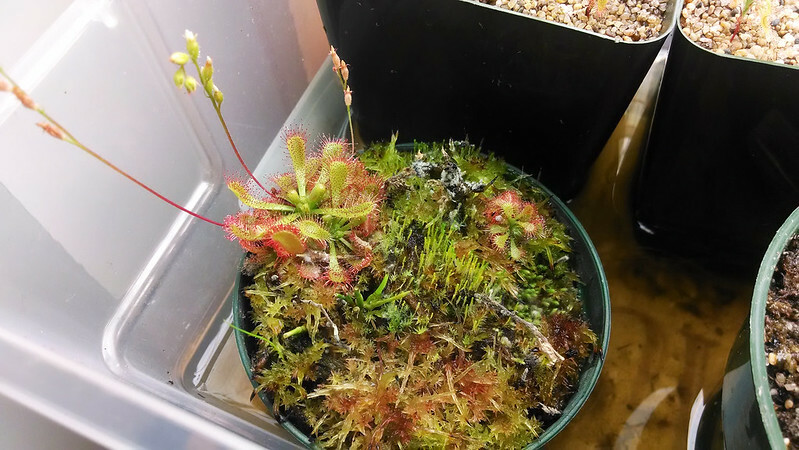 Sundews don't require as much patience as, say, Heliamphora, but it's still good to just give the plant space and see if it will do its thing. Giving up on a plant and just ignoring it can sometimes make that easier! P.S. My Drosera venusta is blooming. Can't wait for seed from this plant.